Review: How do you say that you loved a movie that’s about the horrors of slavery and not sound like a backwards monster? That’s the question I’ve been pondering weeks after seeing the truly remarkable 12 Years a Slave and perhaps why it’s taken me a little longer to move forward with a review of the movie. No doubt about it, this is one of the finest films of 2013 and its handsome production design, score, cinematography, and almost flawless pacing make it a triumph on a technical level too. Still…the subject is so horrifying that it’s thrown me for a loop how to praise it respectfully. An adaptation of the 1853 novel by Solomon Northrup, 12 Years a Slave is a chronicle Northrup’s abduction from Washington D.C. in 1841 and how he winds up in slavery on several southern plantations. Though he was born a free man in New York City, Northrup’s rights are discredited and he endures over a decade of life as a slave. How Northrup survives to write his tale shows a fortitude of the human soul that’s at the heart of this powerful work from director Steve McQueen (no, not that one…the one that directed Shame and Hunger). Chiwetel Ejiofor is the name you’ll want to familiarize yourself with because you’ll be hearing it at the top of the awards buzz as the end of the year draws near. A familiar actor with a diverse background of roles, Ejiofor takes the reins of the film ably and leads a starry cast of A-List actors…but make no mistake, this is Ejiofor’s movie all the way. With a wise earthiness that gives humanity to his oppressed character, Ejiofor delivers a performance of dignity and thoughtfulness that makes the movie even more electric. Ejiofor is just but one of a long list of impressive performances in 12 Years a Slave…so impressive that it wouldn’t be hard to imagine Ejiofor not being the only winner come Oscar night. Making a powerhouse film debut is Lupita Nyong’o as Patsy, a slave Solomon meets when he comes to live on the plantation run by Edwin Epps (Michael Fassbender, Prometheus). Nyong’o’s role is ever so tricky and she’ll knock your socks off the way she handles several of the cruelest scenes the film has to offer. Fassbender too is monumentally effective as the evil owner that delights in working his slaves throughout the day and whipping them when they don’t meet his criteria of daily success. This is McQueen’s third collaboration with Fassbender and while Fassbender’s work in Shame and Hunger were strong, they pale in comparison to how he navigates into the truly unforgivable places Epps has to venture. Among the other impressive actors are Benedict Cumberbatch (Star Trek: Into Darkness) as the first plantation owner Solomon encounters and the one that does the best he can for him even as he struggles with his morality, Adepero Oduye is heartbreaking in her brief turn as a slave separated from her children, and Alfre Woodard is positively dynamite in her cameo. The only actor striking an off note here is the biggest star of all…producer Brad Pitt (World War Z) who shows up late in the film in the kind of role that probably should have gone to someone else when you consider how it factors into the overall scope of Solomon’s tale. Yet the reason why the film hits you at such a deep level is the way that McQueen never lets anyone (good or bad) come off as merely “acting”…the characters all feel like real people because they are played with a commitment that was essential. As evil as the most wicked person is in the film (that’d be either Fassbender, Mud‘s Sarah Paulson as Epps cruel wife, or Paul Dano, even more frightening here than he was in Prisoners) McQueen never lets us forget that these are people with their own set of beliefs and are acting upon them as they feel is right. We, the audience, know that slavery is wrong but it would have been too easy to craft these characters as simply soulless…that they are following what they were brought up to know gets the message home loud and clear that the root of the evil lies in the history, not the present. 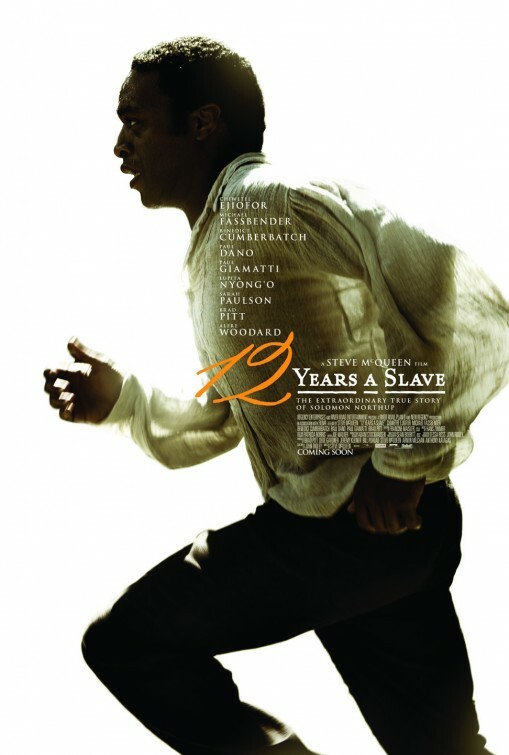 Though the agony of slavery has been captured before in films such as Steven Spielberg’s 1997 Amistad, the landmark mini-series Roots, and yes…even Django Unchained there’s a different feel to McQueen’s work on 12 Years a Slave that sets it apart from the rest. It’s such a well-made, worthy film that I’m hoping audiences and Oscar voters aren’t turned off by the themes and horrific violence (there’s a whipping scene that I wound up having to avert my eyes for). To miss the movie would be missing a film that I believe will stand the test of time.